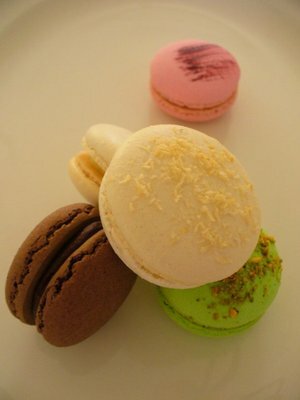 Where's the Best Macaron in Brisbane? First it was the cupcake craze, now macaron mania is gaining momentum. The macaron, thought to have been created in a convent in France in 1791, is two miniature meringue morsels filled with buttercream, jam, or ganache. Especially difficult to make, the perfect macaron should be like an eggshell on the outside and soft and chewy inside. Part of their appeal is that they come in a variety of flavours and colours: chocolate, raspberry, caramel, coffee, coconut, orange, lemon, lavendar, pistachio, and more. The list is endless. Predominantly a French treat, the macaron's popularity in Australia has been rising since Adriano Zumbo's appearance on MasterChef in 2010. After the show aired, people lined up outside his patisserie in Sydney for as long as three hours, just to taste one of his zumbarons. Brisbane has its own share of magnifique macaron makers. The most recent addition, Marché du Macaron, specialises exclusively in macarons. They can be ordered online or over the phone for next day delivery. Authentic French Macarons, created by chef Rafael Silva, can be purchased at the Boutique Markets at Portside Wharf or the Ruffled Bazaar Markets (just look for Dolly Vardens vintage van). Sylvie and Thierry Serplet at Twist n' Roll (Rocklea) are experts at making macarons. You can either buy them at the factory in Rocklea or at Jan Power's Farmers Markets under the moniker Monsieur Macaron. French patisseries are popular places to purchase macarons. Belle Epoque at The Emporium (Fortitude Valley) and French Twist at The Barracks (Petrie Terrace) are both worth mentioning for their melt in your mouth macarons. Do you know where Brisbane's best macaron is? kelvin grove urban village market have best macarons in brisbane. they got more than 10 flavours.